Protecting our men and women who serve in military uniform is critical to our National Security. Force protection cannot just consist of barricades, a security gate, and military and federal uniformed police officers managing access points. A stationary position is an easy target for a terrorist attack. 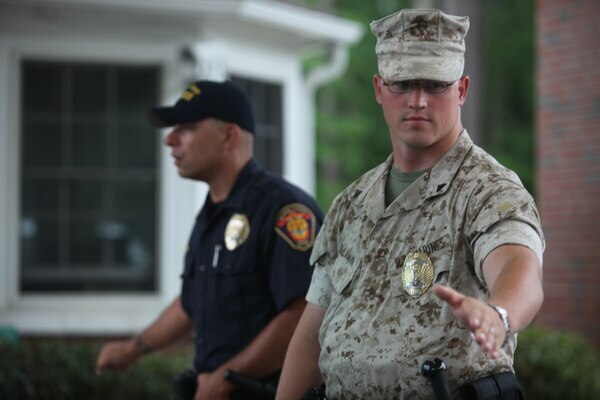 Layers of security to protect the members serving requires expanding the jurisdiction of Department of Defense Police and Military Police from all branches of the service. What about the satellite units such as recruiting stations located in shopping centers? How do we protect our military members here at home? There has been 21 attacks on our military members on American soil. How many more attacks before we face the reality that we need to allow our military to be able to protect themselves and their families here at home. Our military is a target because they provide the blanket of freedom and safety for our nation as the tip of the spear and our strength. Our American warriors need to be able to protect themselves. When unannounced and cowardly “active shooters” bring violence with the intent to kill and harm our citizens at military installations and satellite stations, our military must have the tools to defend not only their lives, but also the lives of everyone else on or near the military installations. Our military, federal, state, and local law enforcement have worked tirelessly together to develop intelligence leads and act quickly to arrest these terrorist planning attacks at home. The reality is that they cannot discover all of these threats in time to prevent an attack. Our first responders have good plans to respond to active shooters; however, the critical time that an attack starts until first responders can react and engage the threats is critical life or death survival situation for those in the immediate path of the terrorist violence and agenda to kill innocent people. Our military must be able to defend themselves without notice, and the only way this can happen is if they are armed. The military police branches in all our armed forces branches needs to be increased immediately and numbers expanded with their responsibilities and jurisdiction of force protection. Military Police (Army and Marine MPs, Navy Master at Arms, and Air Force Security Forces) units are trained to engage “active shooters” and protect life. These important branches of our military services needs to be increased so that we can properly protect our military installations, military and civilian workers, and their families. Trained military police enlisted and officers should be allowed to carry open or concealed 24/7. They understand their responsibilities and are highly trained professional military members and they must be allowed to provide force protection and respond to an immediate terrorist attack whenever and wherever our military members are attacked. Military recruiters and other military satellite units need to be armed when on duty and in uniform. These are highly trained and responsible military members and they must be allowed to defend themselves at home when attacked. We can no longer be political correct and allow soft targets anymore at home. It is our responsibility as citizens to ensure our military men and women have the tools to defend themselves at home. These brave men and women proudly serve our Great Nation and willing risk and sacrifice to provide all Americans security. We must allow our uniformed military to protect themselves at home. Posted in Mark's Articles and tagged Criminal Justice, Force Protection, Force Protection Proposal, K-9, Leadership, Military Crime, Militray, Terrorism. Bookmark the permalink.